In an ultimate sense, God is the one who makes disciples, but when we take a step back from that picture, we should understand that God uses ordinary means to accomplish that end. Allow me to illustrate. If I were to use a shovel to dig a hole, and then I asked, “How was that hole dug?” One might answer, “You dug that hole,” or “The shovel dug that hole.” In a sense, both answers would be correct. I was in control of the shovel. I could have used other means to dig the hole. If I had access, I could have used a backhoe to dig the hole. I could have used a pickaxe to dig the hole. But I chose to use the shovel. One might say that I was the creator of the hole, but the shovel was the means by which the hole was dug. Similarly, God is the creator or maker of all disciples, but God chooses to use human beings as his means by which he accomplishes this task. And which human beings does God use to make disciples? Well, he uses those who are already disciples. Consider Matthew 28:18. Jesus came and said to “them.” Who are they? Who’s the “them”? They’re his disciples. They’re the ones who have already trusted in Christ. So, Jesus takes those who are already his disciples and then he tells them to “go” and make other disciples (Matthew 28:19). In other words, the task of disciple making isn’t given to a select few Christians. The task of disciple making isn’t given only to those who are seminary trained. The task isn’t given to those who have certain spiritual gifts. The task of making disciples is given to ALL Christians! All disciples are supposed to be disciple makers. Listen to the word of God. And Paul to the Christians in Rome. Mutual encouragement. Paul to the believers in Rome and the believers in Rome to Paul. Discipleship is happening both ways. And then later in that same letter Paul writes this. This idea is conveyed throughout the New Testament. We’re supposed to be so involved in each other’s life that we speak God’s word to each other and we grow in our relationship with Christ as a result. This speaking the word to one another might happen in a mid-week home growth group. It might happen in a one-on-one setting as two people read the Bible together. It could and should happen as the Bible is regularly preached every Sunday. The point is simple. This isn’t something only a select few Christians do. This is something all Christians should be doing. Who makes disciples? Everyone who’s already a disciple should be involved in the process of disciple making. Faith comes from hearing and hearing by the word of Christ. Lasting life change in the direction of godliness doesn’t happen apart from hearing the word of God. We must proclaim the word of God. Any attempt to make disciples without the proclamation of the word of God is foolhardy. It’s a waste of time. The word must be proclaimed. How can the word of Christ be proclaimed? The word can and should be regularly proclaimed from every Christian pulpit. The word can be proclaimed as we talk to our neighbor over the back fence. The word can be proclaimed in the office as we share a lunch with a co-worker. The word can be proclaimed in the check-out stand as we wait at the local grocery store. The word may be proclaimed as we share a cup of coffee with a friend who’s asking us for advice. There are a thousand ways the word can be proclaimed, but it must be proclaimed or else discipleship isn’t happening! Are we sharing the word of Christ with someone? But it’s not enough to simply confront someone with the word and then to expect a discipleship transaction to happen. It’s not as if we say these certain words and then someone magically becomes a disciple. We must rely every step of the way of the work of God through his Spirit. In other words, we need to be prayerfully dependent on the Spirit of God. Disciple making isn’t a man-centered formula. Disciple making is ultimately and finally a work of God. God uses us, yes, but it’s ultimately his work. So, as we persevere in sharing the word of God and as we prayerfully rely on the Spirit of God, discipleship happens. That’s how disciples are made. When you think of the word “disciple,” what comes to mind? Do you think of a super Christian? Do you think of someone wearing sandals following after Jesus? Do you think about people who are so engaged in religious stuff that they don’t have time for other things? There might be a hundred different things that come to mind when you hear the word disciple, but what’s of first importance isn’t what we think of when we hear the word disciple, but what does the Bible say about the subject. What did Matthew think when he wrote “make disciples” in Matthew 28:19? What did Jesus mean when he told us to “make disciples”? 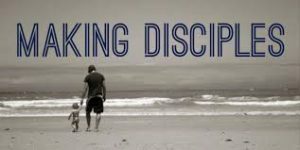 What is a disciple according to the Bible? First, an interesting fact about the word “disciple” in the Bible. “Disciple” is OVERWHELMINGLY the most common way of describing Christians in the Bible. The word “Christian” is only used 3 times in the New Testament, but the word “disciple” appears nearly 300 times in the New Testament. BUT . . . all 300 times are in the four Gospels—Matthew, Mark, Luke, and John—and in the book of Acts. After Acts 21:16, the word “disciple” is no longer used. Now, this doesn’t mean that the concept of a disciple is no longer employed. On the contrary, the concept of a disciple appears throughout the New Testament, but the word itself is used nearly 300 times in 5 books of the Bible and then not again for the rest of the Bible. 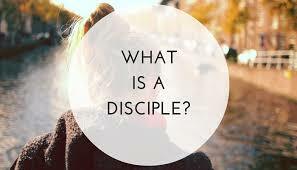 So, what is a disciple? At its most basic level, the Greek word that’s translated disciple carries with the idea of learning or following. So, we could well say that a disciple is a learner or a follower. For example, in Luke’s Gospel we hear the word disciple used in this way. So, whether we’re talking about disciples of John the Baptist or disciples of the Pharisees or disciples of Jesus, a disciple stands in relationship to his teacher. A disciple watches his teacher and learns from him and then imitates his teacher. So, we might say that a disciple of Jesus is someone who is committed to learning how Jesus lived and then following how Jesus lived. And, according to how it’s used by Jesus in Matthew 28, and with how it’s used elsewhere in the Bible, there are two important symbols that are regularly associated with the idea of discipleship. Go therefore and make disciples of all nations, baptizing them . . .
Baptism is a symbol of repentance and faith. It’s a symbol of turning away from that which is old and turning to something new. Baptism pictures a decisive turning from sin and turning to Jesus. Discipleship, therefore, requires first a radical reorientation of our lives to the one we’re following. It’s the idea that I was once going “that way,” but now I’m going “this way.” My life has been reoriented around following Jesus. That’s the first symbol associated with discipleship. 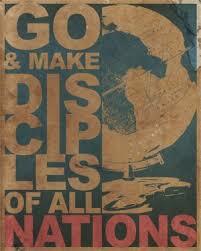 Go therefore and make disciples of all nations, baptizing them . . . teaching them to observe all that I have commanded you. In another part of Matthew’s Gospel Jesus uses the imagery of a yoke to describe this teaching. The yoke was a form of service and submission. The oxen who were in the yoke were under the complete command of their master. These two ideas, baptism and learning, tell us what a disciple is. A disciple has radically reoriented her life to follow Jesus and she has put herself under the willing submission to her new master so that she might learn from him.